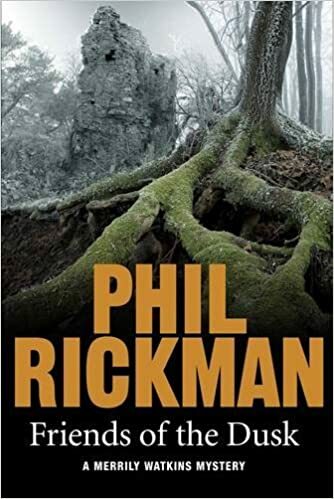 Friends of the Dusk is the thirteenth book in Phil Rickman's Merrily Watkins series, of which I've been a fan for many years. Although I enjoyed The House of Susan Lulham, a short 'extra' novella which preceded Friends of the Dusk, the last full-length Merrily Watkins book, The Magus of Hay, was probably my least favourite in the series - but I'm pleased to say I found Friends of the Dusk to be a real return to form. The story begins with the discovery of an ancient skeleton buried on unconsecrated ground, the skull of which is stolen. However, it's not this 'deviant burial' that Anglican vicar and deliverance minister (or exorcist) Merrily is looking into, but the apparent haunting of a old, isolated property occupied by a builder who specialises in the renovation of listed buildings and his Muslim daughter and son-in-law. Meanwhile, DI Francis Bliss is investigating the brutal murder of a young archaeologist. Needless to say, Merrily and Bliss soon cross paths - but are their cases really linked, and if so, how? Friends of the Dusk sees Merrily return to centre-stage after her disappointingly low-key role in The Magus of Hay. She's not only central to the supernatural elements of the plot, but is also grappling with the threat posed by the obnoxious new bishop to her deliverance role. There's much more of Merrily's daughter Jane in this book too, and it was interesting to see her undergoing something of a crisis of her own (although it's not one that seems to be fully resolved, so I'll be interested to see if it continues in the next book). The relationship between Merrily and Jane has matured convincingly and touchingly over the course of the series, and this is particularly pleasing in this instalment, with far more trust between them and Jane acting as Merrily's unpaid researcher. I was also pleased to see Lol Robinson back from his tour and a stint in the recording studio and playing an active role in the mystery plot as well as in Merrily's personal life. Phil Rickman is particularly good at building characters from bit-parters into main players, of whom there is now a large and varied cast. In Friends of the Dusk, Merrily's mentor Huw Owen and the Bishop of Hereford's secretary Sophie Hill are on truly excellent form - in fact, this may well be Sophie's finest hour yet, and she's always been one of my favourite characters - and the mysterious Anthea/Athena White makes a fascinating return. Like all the novels in the series, this is an atmospheric and gripping read full of Rickman's trademark cliffhanger chapter endings and local folklore references. The supernatural elements are well-executed as always and hang together well with the police-procedural crime plot led by Bliss. There's nothing particularly new here that you won't already recognise from previous books in the series, but frankly, if you were looking for a change you'd have moved on to a different series by now, as the pleasure of the Merrily Watkins comes from the familiarity of the general set-up and the ongoing development of the recurring characters. I thoroughly enjoyed reading this book on holiday and look forward to book 14.